Windows Live Messenger - We heard you !!! 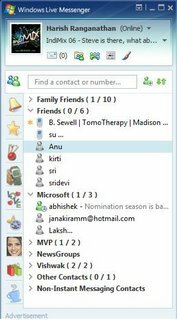 Windows Live Messenger 8.0, the next version of the popular MSN Messenger is one of the coolest services of the Windows Live. My job is not to justify them but, what I really like about Windows Live Messenger is that, it has the much cribbed out, missing feature - "Offline Messages". Offline Messages is one of the features which has been missing quite some time but is now there in Windows Live Messenger. I guess that makes it better and as always, the UI, the other features, the association with MSN Profile, MSN Spaces are all the best features provided with any Messenger Service. Let me clarify one thing here. Offline Messages were not included intentionally because a Messenger Service is not intended for that. Messenger service is a 2 way communication whereas Email is a one way communication. An offline message is as good as an Email and its better you send an important note on an email because offline messages get deleted once its viewed the first time by the receiver. If by accident, the offline messages window is closed, your communication would get lost. It may be useful only for a simple Hi or Ping me, not for sending important information.